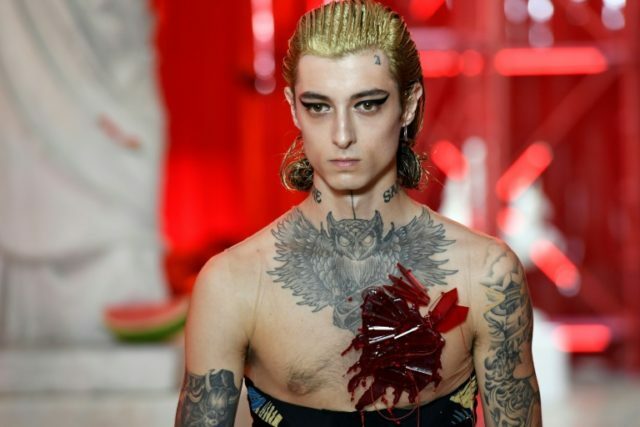 Paris (AFP) – John Galliano set out Friday to redefine 21st-century masculinity with corsets, sensual satins and vinyl trousers to “liberate” men from their sartorial shackles. The British designer’s new collection for Maison Margiela at Paris men’s fashion week not only blurred the lines between genders, but blew them away with shiny pink ribbon belts and a haute couture decadence that rarely treads the male catwalk. With languid satin suits cut loose and worn with nothing underneath and embroidered kimono jumpsuits, Galliano mixed gender-bending David Bowie looks from the 1970s with a more futuristic Japanese vibe. The designer said people’s body language changes with clothes cut on the bias. “You feel really relaxed in it… it’s very fluid but still smart. Still chic. You don’t feel waistbands and you don’t feel canvas or a stiffness. It’s just like wearing a T-shirt. That’s the feeling,” he later told Women’s Wear Daily.